I love the pink argyle sleeves (the Britneys). I like the run or die arms. I posted a link to this giveaway in my giveaway sidebar. I'm a follower :-) and I want the sleeves for HER. I'm in love with the pink and purple argyle sleeves. Too cute! I follow you, and I would want to the hers sleeves. I liked Ink n Burn on fb. I like the purple sleeves. I Liked them on FB and I want the sleeves for her. I like InknBurn on FB! 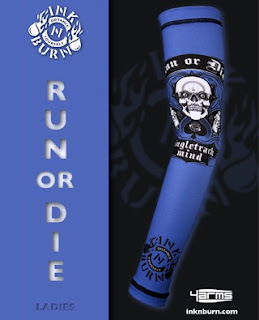 I love the run or die sleeves. Sleeves are such a cool idea, keep you warm without bulking you up! I like the white/gray ones that say Ink N Burn. Linky linking your giveaway on my sidebar. I totally dig the sun totem sleeves! I like Ink N Burn on facebook and I follow your blog too :) I forgot to say that in my above comment! 1. Visited Ink N Burn site. 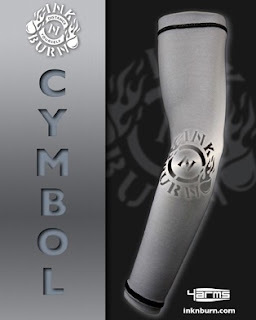 My favs are the Sun Totem arm sleeves. 2. I'm a follower! I'm hoping to win "Hers" sleeves. 3. I "liked" Ink N Burn on FB. 4. I "liked" I Have Run on FB. 2. I'm a follower of your blog and I'm hoping to win "Hers" sleeves. I "liked" I Have Run on FB. I like I have Run on facebook! I posted on facebook. I shared the link that was on I Have Run's page. I love the run or die tees! I follow your blog. I'd love the "hers." I like the pink SaLeafs arms. I follow your blog and I would go for the girly sleeves. I like the Britney sleeves. I love the waverunner arms. Sort of... motivational. And I follow you! I'd be in for the "hers" sleeves. Oh - forgot to say that I want the HERS arm sleeves. Thanks! Wow, you have a busy week! Thanks for the book suggestions too! And I've already had a few comments on my runnerd sticker. I am a follower! I would like to win them because my current arm sleeves have chaffed me and are just plain white! These look awesome! I am posting this on my sidebar right now! I love the Out N Back shirts - I'm not an ultra runner (and never will be), but I like it to rip off In N Out. Oops I think I posted in the wrong spot so here I go. PINK ONES!! I think maybe the HIS ones, but I want them to be HERS. Just like the silver better than the blue. Like I have Run on FB! How can I get one of your stickers? Wanna swap? Awesome! I have never seen these before! I like the Women's Purple Run or Die Sleeves! I follow your blog and I would like to win the hers arm sleeves. I like I Have Run on FB too! I like the Women's Britney 4arms (a cool pink and purple plaid type pattern). I'm adding you to my google reader subscription! I love the Women's Black and Pink Chick'd Tech Shirt and the Women's Green SaLeafs 4Arms. Love anything green! The Women's Green Run or Die 4ARMS rock! I liked on FB...wsnt to win "hers"
I am now following your blog and would like to win the mens arm sleeves. I liked Inkn Burn on Facebook. I liked I Have Run on Facebook. I love the run or die green tech shirt! Super cool! I am a new follower! Weird cause I thought I already was. Apparently I just have you bookmarked :) Hers by the way! I love the Brittany pink/purple plaid arm sleeves! I love the Brittney 4arms. I'm a follower and I'd love to be entered to win the arms sleeves. I like ink and burn on FB. I like I have Run on FB. Posted with link on my FB page. Awesome giveaway! I really like the "Britney" plaid arm sleeves, or the pink Chick'd Tech tee. So cute! I like Ink N Burn on Facebook. I am totally in love with the argyle sleeves. So cute! I follow! I want to win the HIS sleeves. I like I Have Run on FB! I like Ink N Burn on FB! I visited the site. I like the Run Far t-shirt and the Britney sleeves. Very coo1! I follow you lady and I want the Hers sleeves pretty please. I love the britney arm sleeves on the website! I'm a follower! Thanks to Long Legs on the Loose for posting about you. I'm loving the Britney arm sleeves. Pink and plaid :) I'd really be working on my crazy runner style with those! I love the purple run or die sleeves! I love the Blue- Run or Die sleeves! The most cool thing about their site is that they exist - I had no idea! The designs are so cool. I am now a follower of your blog - hers sleeves would be for me. Thx! I follow you! I'd like to win the hers sleeves ). Also posted a link to this on my blog. Just started it up so there I don't really have followers. I follow your blog. I'd love to win the hers sleeves. I like Ink N Burn on FB. I checked out their website and I like the Sun Totem sleeves and the Surf City tech shirt. I love the green SaLeafs! I follow, and would like to win women's sleeves. I like the Women's Pink SaLeafs. I follow your blog and I would like to win the "hers" arm sleeves. I like I Have Run on Facebook. I like the Sun Totem 4ARMS. Very cool stuff! I tweeted the giveaway (@knitterphd). Posting your giveaway on my sidebar!